Grissom High School's left-handed pitcher Daniel James checked Ooltewah on three hits and struck out 14 Friday in the Tigers' 7-2 win over the Owls in the Ooltewah Invitational. James fanned seven straight Owls during one stretch. 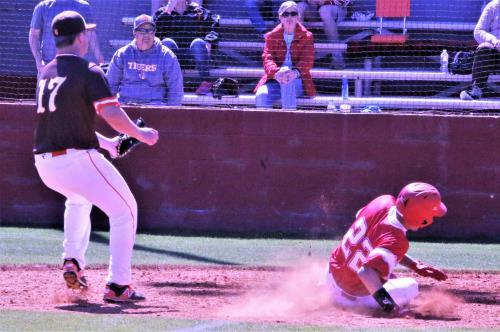 Grissom baseball coach Travis Tate saw his Tigers attack Ooltewah pitching on Friday and it wasn’t anything he hadn’t seen from other teams in Alabama’s Class 7A baseball over the years. The Tigers’ first inning was a perfect example. Leadoff batter Hunter Zuidema scorched a grounder past third baseman Kael Williams and ended up with a triple. Williams barely had time to react to the ball. Zach Thomson followed with an opposite-field line drive for a run-scoring double. Evan Koob ripped a blue-darter to right, a ball that Tyler Phillips snagged. Sullivan Woodlee punched a hard-hit ball into left for a single and after a strikeout Blake Madewell blasted another RBI double to center that drove in the Tigers’ third run in the opening inning. Grissom then relied on left-handed pitcher Daniel James to control Ooltewah’s bats, and he was masterful for 6 1/3 innings. James checked the Owls on three hits – two by Phillips – and struck out 14, including seven in a row during one stretch and the Tigers walked away with a 7-2 victory on a beautiful sunny day for baseball in the Ooltewah Invitational. Ooltewah coach Brian Hitchcox would have none of that. Tate has a tough time putting a descriptive tag on James. “He’s not overpowering, his first-strike percentage wasn’t where we wanted today, but he got better at that,” Tate said. “He likes to throw a breaking ball and change back-to-back and that gets a lot of batters out. There was nothing funny about James’ mound performance in the second of three days in the Owls’ annual invitational. James had six strikeouts in three innings. He then, after fanning Colby Taylor end the third, struck out the side in the fourth and fifth innings to give him seven in a row. James whiffed Wes Duncan to end the sixth. James hit Trevor Dunlevy starting the and Phillips’ triple pushed Dunlevy home with the Owls’ first run. Phillips later scored on a wild pitch and James struck out Williams for the first out. Tate went to his bullpen at that point and John Allen Stogner struck out Ooltewah reliever Trevor Robinson and Quentin Ingram to end the game. The two Tiger hurlers combined for 16 strikeouts. Thomson slugged a third-inning home to push Grissom’s lead to 4-0. The Tigers extended the lead in the fifth on Daniel Branum’s two-run double. With one out in the seventh, Koob doubled to left, moved to third on a wild pitch and scored on Branum’s single into shallow center. Branum went 3 for 4 and drove in three runs. Thomson was 2 for 3 with two RBIs and scored three runs. James, Stogner (7) and Madewell; Mackaluso, Robinson (4) and Dockery. Franklin County 12, Ooltewah 1: Franklin County scored 12 runs in the first three innings and Kal Rigsby scattered six hits and the Rebels routed the Owls to cap the day’s action at Ooltewah. Rigsby turned in a complete game and struck out seven and walked two. Ooltewah’s lone run came in the fourth inning when Fisher Perry walked and scored on Trevor Robinson’s RBI double to center field. Garrett Dayett had a hit, drove in two runs and scored twice for the Rebels. Mike Stolzfus added two hits, two RBIs and scored once. Chase Rhoton had a hit, walked once and scored three runs. Ooltewah’s Clay Kilgore gave up six runs on three hits in one inning and took the loss. Bradley Central 13, Warren County 3: The Bears banged out 16 hits and scored three runs in three different innings to thrash the Pioneers. Riley Black went 4 for 4 and drove in four runs while scoring once to lead the Bradley offensive onslaught. Jake Thompson had three hits in for at-bats and four RBIs. In the third inning, Black’s double scores Dylan Standifer, Thompson’s sacrifice fly pushed a second run across and an Eli Wilson single scored courtesy runner Ashton Simmons. Thompson had a run-scoring single in the fourth, Tucker Hill’s hit scored Thompson and Simmons, running for Black, scored on a two-out error. In the sixth, Still, Iverson Vasquez and Freddy Johnson were each hit by pitches. Standifer delivered a sacrifice fly, Black drew a bases-loaded walk to score Vasquez and Thompson’s single to right pushed Johnson across home plate. Cooper Casteel pitched a six-inning complete game, scattering six hits and giving up three runs, just one earned. He struck out four and walked two. Lincoln County 4, Soddy-Daisy 3: Spencer Gore singled and later scored on Harrison Travis’ sacrifice fly and Hayden Maynor, who reached on a walk, scored on a Lincoln County error as the Trojans built a 2-0 lead. Soddy-Daisy added a single run in the third when Landon Maynor was hit by a pitch. Will Ackerman ran for Maynor and scored on Hayden Maynor’s sacrifice fly for a 3-2 lead. Lincoln County scored twice in the fifth and Landon Maynor took the loss. He went seven innings and gave up five hits and four runs. He recorded six strikeouts and walked two. Maynor threw 108 pitches, 71 for strikes. Lincoln County 13, Chattanooga Christian 3: Jackson Cothren hit a pop fly to right with the bases loaded and it turned into a grand slam in the seventh inning for Lincoln County. The Chargers’ Amos Davenport had two hits and drove in two runs. Chattanooga Christian used three pitchers – Taylor Anand, Will Bolyard and Zach Allen – and Lincoln County collected 10 hits and scored three runs in the second and third innings then put up seven in the sixth. East Hamilton 12, Silverdale 2: Bradley Garland went 4 for 4, including a triple, and drove in two runs and scored twice to pace the Hurricanes’ offense. William Campbell had three hits with two doubles and two RBIs. Noah Pridmore had two hits in four at-bats and drove in two runs. Chase Roberts (1-1) picked up the win, recording four strikeouts in two innings of work. Isaac Moulds struck out the side in the third and Clay Honeycutt and Blaine Savage also had time on the mound. East Hamilton 19, Brindlee Mountain 1: The Hurricanes continued an offensive onslaught against Brindlee Mountain (Alabama) in the invitational by banging out 13 hits and 19 runs. Pierce Durham’s led the way with a home run, triple and single and six RBIs. Conner Thornburg had a RBI triple and Josh Brown belted a triple with three RBIs. Mitch Dennis had two hits collected two hits, drove in a run and scored three. Walker O’Rear added two hits and one RBI. 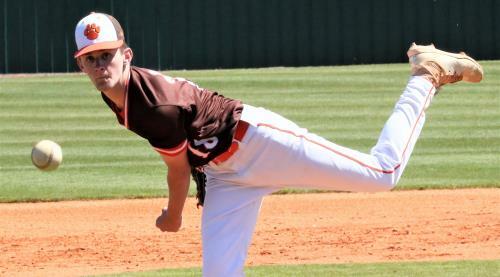 Cole Hixson (1-0) was the winning pitcher and three other hurlers joined Hixson in combining on a two-hitter. East Hamilton and Silverdale each have 7-2 records. Ooltewah's Tyler Phillips (22), who drove in a run with a triple in the seventh inning against Grissom on Friday, scored moments later on a wild pitch. The Owls fell short of the Tigers, 7-2, in their own baseball invitational.